This former Trent Jones Snr. designed course and driving range has been completely rebuilt to a new Tom Fazio design. The area of ground that supports the expanded golf holes, measures some 73 Ha, the area of the driving range measures circa 8 Ha. All of these areas have been shaped, drained to 5m centres and sand capped. 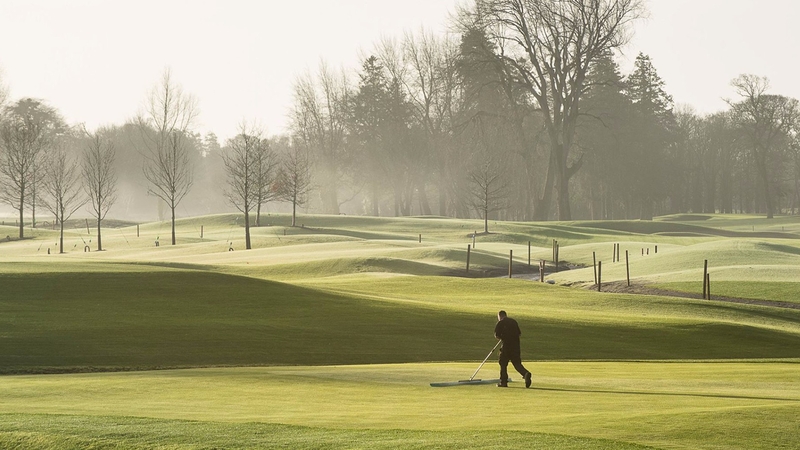 The greens and tees have all been reshaped and rebuilt to the exacting USGA standard specification and have been enabled to support the installation of Ireland's first sub air system. The Course is already being earmarked to hold major championships with the hosting of the 2026 Ryder Cup , the dream of owner J.P. McManus. 7km of tournament support roads have been installed, kerbed and tarmacadam surfaced. 21km of ducting carrying fibre optic cables, required for the running and coverage of a large golf tournament have been installed. The project will have been completed and the course ready for play, fully 2 months earlier than the date set out in the construction programme. A remarkable demonstration of Atlantic Golf Constructions strength and ability to resource a project of such high standard and quality, as programme had initially been set on a total shaping area of 25Ha and total sand cap of 15Ha. Re-modelling 18 championship golf holes & driving range. Reconstruction of all 18 greens and tees to full USGA specification. Installation of capillary concrete in the base of all 40 course bunkers. New Automatic Irrigation System installed with full coverage of greens, tees and fairways. All reshaped and rebuilt areas are to be sand capped some 73Ha on golf course and some 8Ha on the Driving Range. 7km of tournament support roads have been installed, kerbed and tarmacadam surfaced. Over 21,000 ml of fibre optic cables installed. 12 new Bridges have been built, faced in natural stone.